Backpacking is all about keeping your total packed weight as low as humanly possible. In the ultralight community, some people go as far as shaving down the handle of their toothbrush and fork, all in the name of going ultralight. Needless to say, every ounce counts. Backpacking quilts have grown in popularity in recent years as an alternative to traditional sleeping bags. They are lighter in overall weight and offer more versatility than a standard sleeping bag. A well-designed quilt gives you the option to wrap it around yourself like a sleeping bag, use it as a blanket, or have something to throw over your shoulders around the campfire. Backpacking quilts are growing in popularity with backpackers, hikers, and mountaineers due to their small size and ultralight weight. We put together a list of the 5 best backpacking quilts that offer excellent functionality and an awesome warmth to weight ratio. 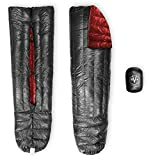 Paria Products Thermodown 15 Degree Sleeping Quilt is a versatile backpacking quilt that gives you a variety of options that a sleeping bag won’t. It can be completely closed similar to a sleeping bag and it has cinch cords at the footbox and collar to keep your body heat in. 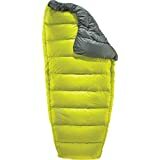 It uses 22-ounces of 700 fill down that provides excellent loft on cold backcountry evenings. The outer shell is made of 20 denier ripstop nylon and the inside of the bag is 320T polyester. Overall, this bag has a 15° EN rating, making it a good fit for cold winter evenings. The quilt is 78 inches long and 56 inches wide, so it’s good for anyone up to about 6 feet tall. There are horizontal baffles that keep the down fibers evenly distributed throughout the night. The overall packed weight is 2 pounds and 3 ounces, while the packed size is 10 x 7 inches. WARM - Stay toasty warm due to the large baffled construction and 22 oz. of high loft 700-fill power down which provides a temperature rating down to 15F (-10C). LIGHTWEIGHT - No need to compromise on size and weight. The quilt comes in at only 2 lb. 3 oz. and the included compression sack cinches down to just 10 x 7 inches. Use the included sleeping pad strap to secure your quilt to an insulated sleeping pad for a lightweight and compact sleeping system. DURABLE - The light, but durable, 20D ripstop nylon fabrics will ensure that the quilt performs for countless adventures. VERSATILE - Our quilts offer incredible versatility that is unmatched by traditional sleeping bags. Open up the quilt for warm weather or close it up completely on those chilly nights. Since they're so easy to adjust, they're also perfect for hammocks. Outdoor Vitals StormLoft Down Backpacking Quilt is an ultralight quilt that offers versatility, durability and warmth. There are 2 sizes to choose from: regular and large. The regular sized quilt weighs in at 23 ounces and the longer version is 26 ounces. It has a 15° EN rating and uses 800 fill StormLoft water repellent down insulation. 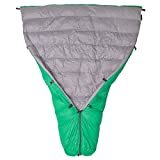 The outer shell of the quilt is made of 10 denier ripstop nylon and uses both horizontal and vertical baffles to evenly distribute the down for balanced warmth. The footbox is fully sewn and baffled to eliminate cold spots and keep your feet warm throughout the night. It includes a pad strap, so if your using a sleeping pad you won’t have to worry about the quilt slipping off in the night. Cadillac of TopQuilts: The new StormLoft topquilt not only features premium treated down but features the best materials in a superior baffling design for the most warmth and least weight! This is a quilt designed for laying in a hammock, however, it works the same as a backpacking quilt. With a 50° temperature rating, it’s designed for summer months or shoulder seasons when the weather is warmer. If you need to get it lower than the 50° rating you can pair it with another quilt to increase thermal efficiency. It comes with synthetic insulation and nylon ripstop fabric that’s coated with a durable water resistant finish. The water-resistant finish and synthetic fill mean that it can handle light rain or dew in the morning while still keeping you dry and if it does get wet it’s going to dry out quickly. The convertible footbox has snaps and velcro so you can further insulate the low portion accordingly. There’s also a cinch cord on the bottom of the quilt that you can tighten for more warmth. There’s a stuff sack included and it packs down into 18 x 12 inches. WEATHER READY: The warm and affordable counterpart to the Ember 2 UnderQuilt (sold separately), with a temperature rating of 40-50 degrees Fahrenheit, the Spark TopQuilt makes for the coziest hammock partner. WARMTH STAYS IN: Features an easy to use convertible footbox that makes for a quick entry and exit, all while keeping the heat in. Made from the softest nylon taffeta lining, you won't want to leave. FOUR-SEASON HAMMOCKING: Feel safe and stay dry knowing that the Spark is finished with DWR (durable water repellent), which repels moisture and keeps you comfy and secure through any storm. COMPACT CAMPING: Includes a nylon compression stuff sack for easy storage and only weighs 27 ounces. Unfolded Dimensions: 6'8" x 4'2". Therm-a-Rest Corus quilt is an innovative and technical down quilt with a simple design packed with features. It comes with a quilt design that gives you freedom of movement and comes with the familiarity of the blanket at home. There are sewn baffles throughout with reflective tape on the seams that reflects the heat back to you on the seams. The insulation is 650 fill hydrophobic down that’s treated with nickwax. This basically means that you end up with packable and lofty down that’s resistant to moisture. The temperature rating is 35°-45° and if you take on moisture the hydrophobic down resists the moisture to keep you comforable. It comes with an innovative pad attachment system that isn’t found in any other backpacking quilts. The elastic footbox has a stretchy portion on the underside that wraps around a sleeping pad to hold it in place. It packs down into a small stuff sack and only weighs 1.6 pounds. The Therm-a-Rest Vela quilt is a good quilt for backpacking and camping during Spring, Summer, and Fall. The temperature rating is 35°-45° and it’s always better to go with the higher suggested temperature rating to make sure that you stay warm at night. The footbox has elastic around it that wraps around the base of a sleeping pad with an extra baffle on the side to limit the air from entering. There’s also elastic on the sides that make it easy to secure around the entire length of a sleeping pad. The insulation is 650 fill power down with Nikwax hydrophobic coating that maintains its thermal efficiency when it gets damp. There are thermocapture seams on the quilt along the baffles that reflect heat back onto your body. There are also snaps along the side for securing a sleep system in conjunction with the quilt. Contrary to popular belief, a backpacking quilt is more than just a down blanket. Compared to a standard down sleeping bag a quilt is lighter, packs down to a smaller size, and is more versatile in the potential uses. All of these features make backpacking quilts popular with everyone from the ultralight backpacker to the weekend warrior types. In terms of comfort, a backpacking quilt has the same feel as the blanket on your bed at home. If you’re backpacking in warmer climates you can spread out and let your arms and legs hang out to keep cool. If a colder trip is on the itinerary, you can simply enclose yourself just like a mummy bag. Finding your first backpacking quilt is similar to choosing a down sleeping bag. There are a few simple steps to follow and key considerations to keep an eye on. A sewn footbox is permanently enclosed, meaning that you can’t open it all the way up like a blanket. This is a nice feature when cold weather is a concern, however, it limits the versatility that a quilt typically provides. The unsewn footbox gives you more versatility due to the fact that you can open and use it to cover another bag in winter, making it a more versatile piece of gear. You may not have the same insulating properties as the sewn option, but you have more freedom to use the quilt however you please. A zippered or snapped footbox, as the name suggests, can be closed by a zipper or buttons. It gives you the ability to close it in cold weather and leave it wide open on hot days. This is the most versatile choice of the three choices, however, it won’t insulate as well as a sewn footbox. The main reason that you use a quilt is to stay warm at night. Down provides warmth by trapping the air in the layer between you and the outside of the backpacking quilt. The thicker the layer of trapped air, the better it’s going to insulate you. The thickness of the down material is referred to as “loft”. The “loft” or the amount of fill (fill power) that’s inside the quilt determines how warm the quilt keeps you at night. High fill ratings are important to weight sensitive endeavors, such as backpacking. For example, a 550 fill down requires 50% more weight than an 800 fill down quilt to provide the same amount of warmth. In 2005, the EN 13537 rating system was developed in Europe and introduced to give consumers a way to compare sleeping bags head to head. In order to qualify for an EN rating, each quilt has to be independently tested and provided with a rating. The testing process involves taking a manikin with heat sensors into the sleeping bag and artificially dropping the temperature in the room. They then measure when the heat accumulates, range when the temperature remains steady, when it begins to lose heat, and when the bag is useless. This gives them an accurate tool to then reward the sleeping bag or quilt with a EN rating. The EN rating right for you is completely dependent on how, where, and what time of year you plan on using the quilt. If there is no rating take a look at the manufacturer’s suggested rating and add 10° just to be safe. Also, read some reviews of verified purchases to get an honest answer and go from there. Backpacking quilts are synonymous with versatility and it’s a big part of the reason that they have become so popular in recent years. Quilts give you the flexibility to fold them up like a mummy bag on cold evenings and open them up like a blanket on warm summer nights. They can be used year round in a hammock, tent, and underneath the stars. A sleeping pad isn’t required when using a backpacking quilt, but the ground gets uncomfortable quickly. When sleeping with just a quilt, it’s nice to have some padding to make the nights as comfortable as possible. Attaching a quilt to a sleeping pad is different with each quilt. Some offer integrated straps and shock cords that are built into the design of the quilt, while others require a separate pad attachment system. The easiest way is to simply choose a quilt that comes with an integrated pad attachment in the original design. The shell of a quilt is the outer layer and it’s there to protect you from wind and rain. It’s vital to stay dry and warm on a backpacking trip, needless to say, the shell material is an important consideration. The shell of a quilt is typically made of polyester or nylon denier. The higher the denier rating the more durable the fabric is going to be, however, it will also be heavier. Nylon is more durable and a denier rating of up to 30 will remain lightweight while offering adequate protection. With the steady rise in popularity of backpacking quilts, making the switch is definitely worth your consideration. They are typically around 30% smaller when compared to a sleeping bag of similar size. 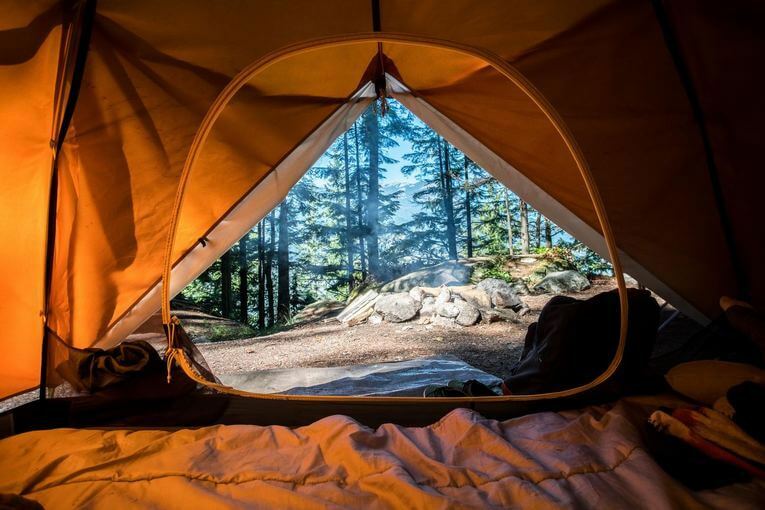 A backpacking quilt is an excellent alternative to a sleeping bag as long as you choose a temperature rating that will keep you warm enough throughout the night.